Walleye are a member of the perch family. 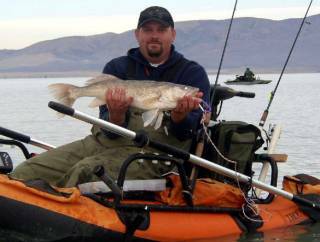 They are also a 'cousin' the sauger, which are not found in Utah. Used to be classified as Stizostedion vitreum, but now classified as Sander vitrius. Prominent "canine" teeth distinguish this big perch from its smaller cousin, the Yellow Perch. Color is brassy olive buff, sometimes shading to yellowish sides and white beneath. Large, dark blotch at rear base of the first dorsal fin and the lower lobe of tail is white-tipped. The tail is moderately forked. Walleye are light sensitive. The huge eye is constructed to gather light in dim conditions and let walleye have a sight advantage when there isn�t much light. The eye becomes a liability in bright conditions. Translation: Night fishing can be very good for walleye, especially in clear water. 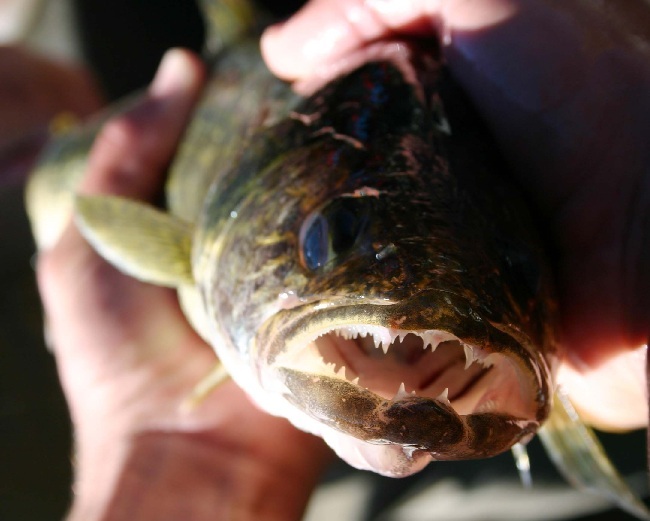 Some popular lures to use for walleye include jigs, curly tail grubs, bottom bouncers, worm harnesses, minnows and other similar lures and bait.